During this morning's Il-Festa l-Kbira press event. The Valletta 2018 Foundation has announced details of Il-Festa l-Kbira – a one-off event in which the four main feasts and the two band clubs of Valletta come together for the first time ever as part of the Valletta 2018 Cultural Programme. Festivities will take place from the 4th till the 7th April in Valletta and the Grand Harbour. Valletta 2018 Foundation Chairman Jason Micallef said, “This is indeed a special occasion which brings together the Valletta community as one as well as the Cottonera community who will be participating in regatta races”. The highlight of the programme will be on Saturday 7th April when processions with the titular statues of St Paul, St Dominic, Our Lady of Mount Carmel and St Augustine, take place following mass in the four churches involved. The four statues will meet at St George’s Square where Archbishop Monsignor Charles J. Scicluna will lead prayers. The titular statues, along with the bands accompanying them, will make their way through Republic Street to City Gate before heading back to their respective churches. On Friday 6th April, a march and joint concert by the King’s Own Band Club and the La Valette Band Club will be taking place in St George’s Square. The Minister for Justice. Culture and Local Government Owen Bonnici said, “Band Clubs are part of our country’s cultural tradition and an integral part of what constitutes the Maltese and Gozitan social fibre. The Ministry for Justice, Culture and Local Government concretely supports the Local Band Clubs as it strongly believes that these are voluntary organisations that play an important role in our communities. The Parliamentary Secretary for Consumer Protection and Valletta 2018 Deo Debattista said, “This event is an excellent opportunity for the community, band clubs, residents, festa enthusiasts and all those who participate in one of the four festas each year were given their own spotlight during Valletta 2018. Il-Festa l-Kbira reflects just how inclusive the Valletta 2018 Cultural Programme is, as citizens and artists alike were given a voice”. As part of the programme, the Basilica of Our Lady of Mount Carmel will be consecrated while new paving inside the church will be inaugurated. The regatta that traditionally takes place on the 31st March will this year be organised as part of Il-Festa l-Kbira. A special race for over 40 regatta participants, described as ‘old heroes’ will take place. This regatta edition will also include the Valletta 2018 Special Shield. 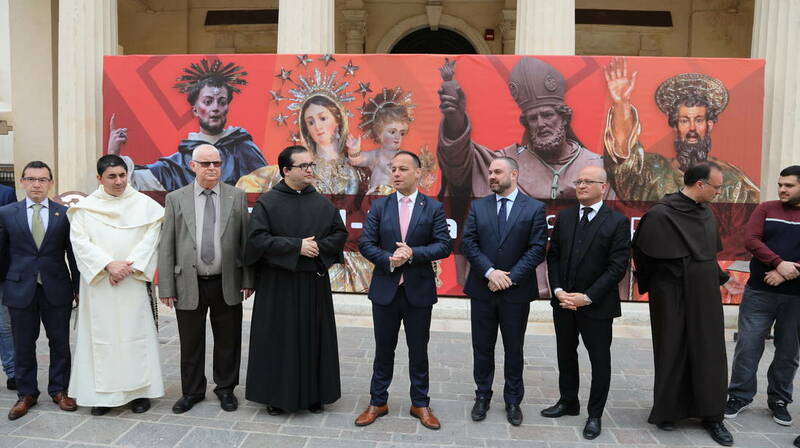 Chairman Jason Micallef thanked Archbishop Scicluna, the Curia, Sports Malta, the police and the Valletta and Cottonera communities for the enthusiasm and support shown in the organisation of this event. Il-Festa l-Kbira includes the participation of the Parish Church of Porto Salvo and Saint Dominic, the Parish Church of St Paul’s Shipwreck, the Parish Church of St Augustine, the Church of Our Lady of Mount Carmel, the Società Filarmonica Nazionale La Valette and the Società Filarmonica King’s Own. King’s Own Band will be accompanying St Dominic’s statue, La Valette Band accompanies St Paul’s statue, Queen Victoria Band of Zurrieq will accompany Our Lady of Mount Carmel and Beland Band of Zejtun will accompany St Augustine’s statue. 9:00pm The King’s Own Band Club and the La Valette Band Club hold a joint concert in St George’s Square. Each band will hold a 40-minute programme which also includes a short speech to mark the occasion, with a total of 100 minutes.